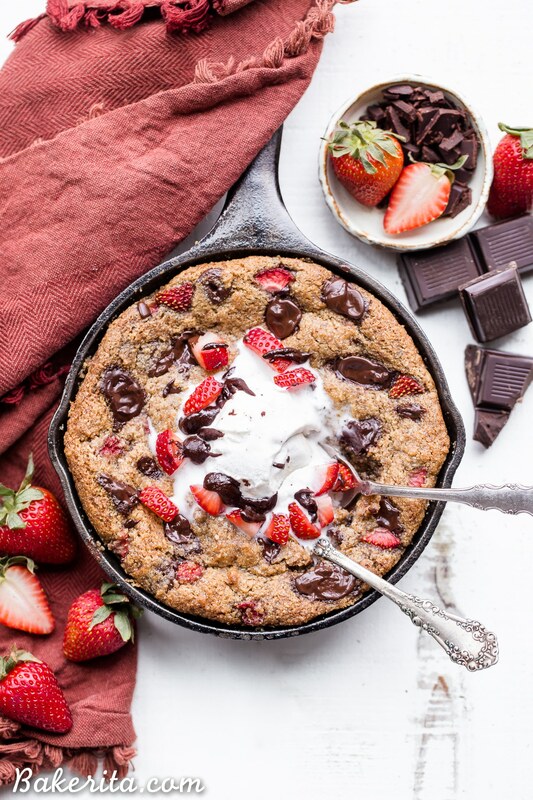 This Strawberry Chocolate Chunk Skillet Cookie is gooey in the middle, with crispy edges and all the flavors you love in a chocolate covered strawberry! 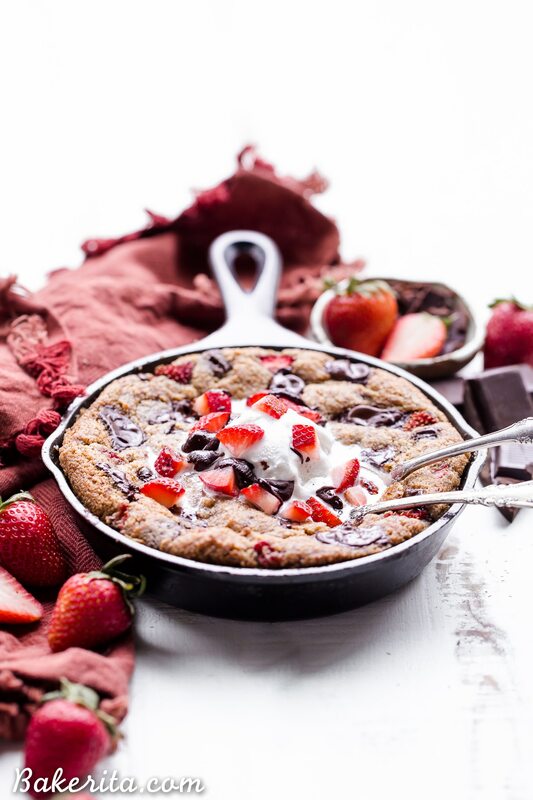 This gluten-free, paleo and vegan skillet cookie will satisfy all your cravings – the fresh strawberries are the perfect fruity addition to this rich, chocolatey treat! So today, with this Strawberry Chocolate Chunk Skillet Cookie, I had a couple of bites and then took ALL OF MY SELF CONTROL and covered it up and popped it in the fridge – out of sight, out of mind, right?! Doesn’t work as well when I’m sitting here drooooling over the photos as I edit them, though, and convincing you guys of the greatness of this strawberry chocolate chunk skillet cookie – because it is GREAT, indeed. 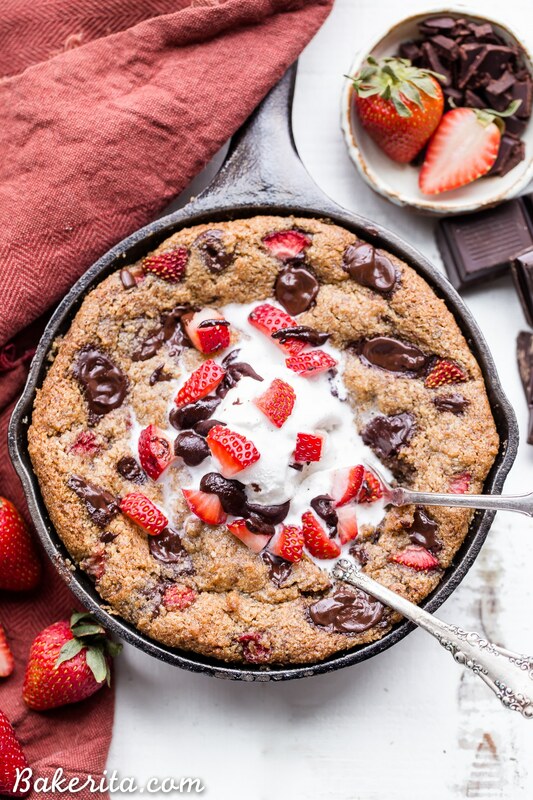 Strawberry Chocolate Chunk Skillet Cookie! So, the recipe starts with coconut oil and a little almond butter – the almond butter helps add a rich, gooeyness to the cookie that’s irresistible! Coconut sugar is used to sweeten things up, and a flax egg helps it all come together. You could use a real egg if you’d prefer, but I wanted to keep this recipe vegan. For the dry ingredients, you just need almond flour, baking soda, and salt. Easy peasy. And now for the stars of the show – STRAWBERRIES and CHOCOLATE. I used fresh diced strawberries, and I would recommend sticking to fresh. I imagine that frozen would add too much moisture and make things mushy (we definitely don’t want that). For the chocolate, I went with dark chocolate chunks. I always like chocolate chunks over chocolate chips, because they just melt better – chips usually have waxes added to help them keep their shape, which makes them not get gooooeyyy and melty like we’re after. 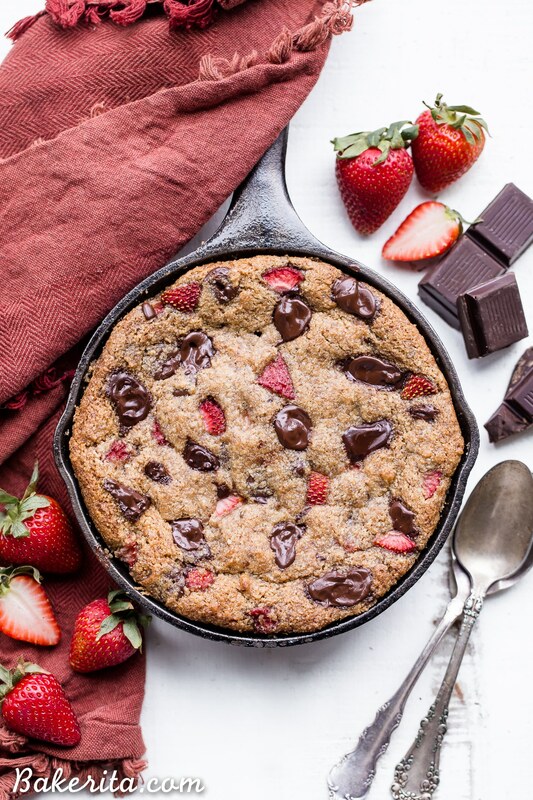 Once baked until golden brown, you’re rewarded with a Strawberry Chocolate Chunk Skillet Cookie that has crispy edges, a gooey center, and chocolate and strawberries in every bite. The result is luscious and flavorful – the strawberries add a nice freshness, especially if you top with extra fresh strawberries! You’re going to LOVE this one – enjoy, friends! 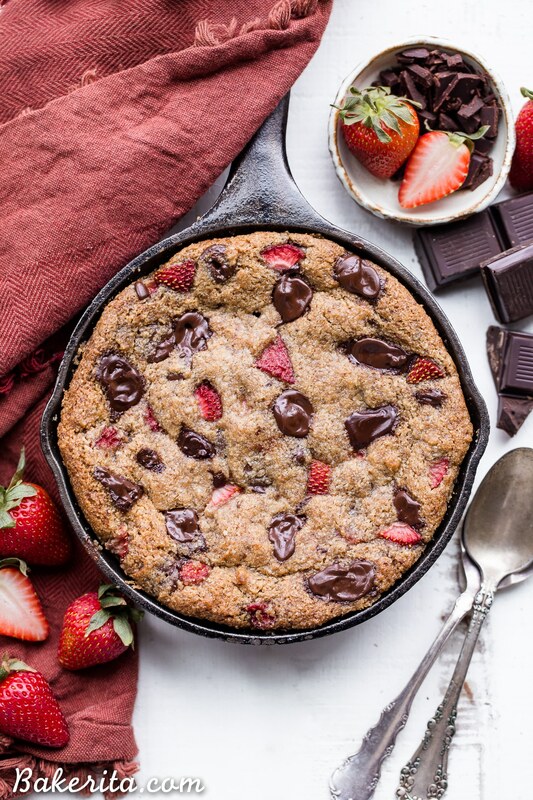 This Strawberry Chocolate Chunk Skillet Cookie is gooey in the middle, with crispy edges and all the flavors you love in a chocolate covered strawberry! 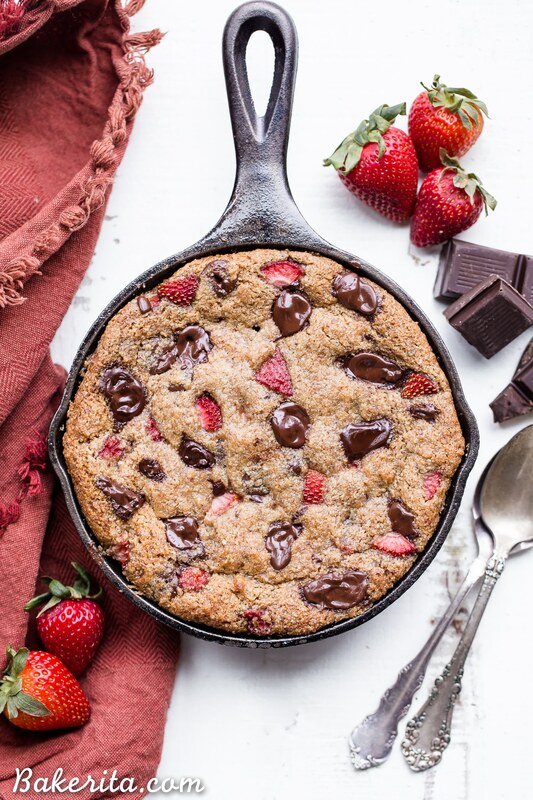 This gluten-free, paleo and vegan skillet cookie will satisfy all your cravings - the fresh strawberries are the perfect fruity addition to this rich, chocolatey treat! Preheat the oven to 350ºF. Lightly grease a 6" cast iron skillet with coconut oil. Double the recipe if you're using an 8" skillet! In a medium mixing bowl, stir or beat the coconut oil, nut butter and coconut sugar until smooth. Add the flax egg and vanilla and mix until smooth. Add the almond flour, baking soda and salt to the wet ingredients. Mix until well incorporated. Gently fold in the chopped chocolate and strawberries. Press the dough into the prepared pan and bake for 23-25 minutes or the edges are beginning to turn golden brown and the center is cooked through. Remove from oven and let cool for ten minutes. Serve warm - it’s great alone, or add fresh strawberries, chocolate sauce, and/or ice cream on top! Is a flax egg required or can I use a chicken egg? You could use a regular egg, I haven’t tested it that way though! You might want to use just the yolk. Enjoy! * Can I use cacao butter instead of coconut oil (like your chocolate recipe)? * What brand of dark chocolate do you chop up or do you make your own? This looks so good. I love that it’s vegan too! Thanks so much for the love, Christina!! These look great! Making it as I’m writing this! If I want to make it into individual size cookies, how much time would you estimate in the oven? Thanks so much! Hi Jennifer, I’d guess somewhere between 9-12 minutes, depending on how crispy you like them. Let me know how it turns out as individuals! Hi Katie, glad you enjoyed it. I can see how the way you made them made it seem like two serving sizes since you put them in individual dishes, but in the skillet it definitely seems like more than two. I have every size cast iron but a mini. I was just telling my hubby we need to get some of this cute lil size! This looks like the perfect recipe to start with! You’re making me drool! Hello This looks amazing! I don’t have almond flour on hand. Can I use something else instead? Quinoa, regular, spelt? I’ve only tested with almond flour, but regular or spelt should work :) enjoy! Thanks for sharing this amazing recipe! Do you think this will work as individual cookies as well? Thanks in advance! Who doesn’t love a skillet dessert? Yum! I’d have to agree- aren’t they the best? Thank you Melissa!